That’s fine if it meets the load, and the system holds set point. Best to use a slab sensor with an outdoor reset so you can help control the fly wheel effect from the mass. Very good. Slab sensor tube is futured, accessible from adjacent basement. Considering Tekmar 519 for this job. Boiler has od reset and is swinging around but load is gaining well with 105 max. Depends on the application. For a bare concrete or hard surface radiant in a home, you probably want to keep the max. surface temperature around 80- 83F. The SWT depends somewhat on how well the under slab insulation works. Higher R under the slab the lower the SWT. Tube position in the slab makes quite a difference also in SWT required. Slabs with wood or carpet and commercial slabs may need higher temperature of course. The lowest possible temperature to cover the load, as Gordy mentioned, that could be 80F SWT or lower in some low load super insulated homes. 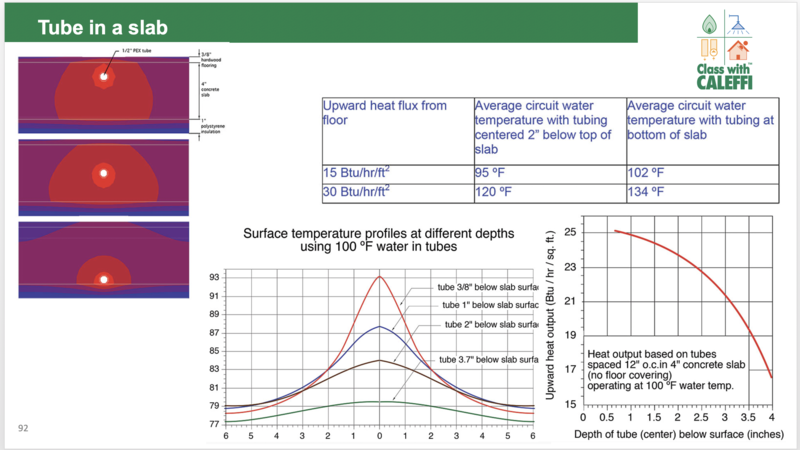 2 BTU/ square foot output for every degree difference between slab surface and ambient. If the load is say 10 btu/ sq ft in a low load home 75F slab- 70F ambient = 5X2= 10 btu/ ft output. Same applies to mild low load days, so the outdoor reset controls can really lower SWT when the load is low. Other high temp radiation will be connected to serve other space later, but I suppose a motorized mixer like Taco iSeries with integrated OD reset (or comparable) would be much better than my budget-oriented Honeywell AM1. Yeah, you really don't want to over-heat a slab, or send higher SWT than you absolutely need as it can flywheel for days trying to simmer back down. I am not a heating professional, but I did a lot of control engineering in one of my former lives. Based on that, and based on my own experience with radiant slab at grade, I would suggest that you not run radiant slab with a fixed temperature water supply. You would almost certainly be better off with an outdoor reset system to supply just the right temperature water to the slab, and that supply temperature depends mainly on the outdoor temperature. Before I put in a mod-con with outdoor reset in my house, it was very difficult to get even heat. The main part of the house is radiant slab at grade and the old GE boiler supplied a constant temperature +|- 5 degrees or so, to the slab. I do not know what temperature that was, but the floor got pretty hot sometimes. The problem is that the control system had way too much overshoot. When a call for eat came, the boiler put hot water into the floor. It took quite a few hours to heat up the slab, then the house. By the time the thermostat felt warm enough, the slab had over a day's supply of heat in it, so even when the boiler stopped the house would get hotter and hotter, sometimes 5F over the set point. A mod-con with outdoor reset cured that. Now it keeps 69F +|- 1F all the time. Where you get into trouble is inconsistent loads. Such as wide outdoor temp swings from day to night, or wide swings going from -30- +45 in a couple days........if the envelope is high load not so bad, but today's construction, and modern radiant slab insulation details modulating water temps is a must. Add indoor feedback with ODR and you get even a tighter control on undesirable over-shoot. I have used a floor thermostat w/ fixed water temp to warm a floor ... it works great when there is another heat source to managed the actual room temp. (panels) (forced air) It's difficult when you are trying to heat a space using this type of control alone unless it's a very low BTU area. The higher the mass the harder the control -- same with any large swings in outside temp -- solar gain. Outdoor reset is the way to go .. it can still require tweaking. Example: I have a big sprawling house in NJ with various radiant all over it ... I use the Buderus control on the manifold in the oldest part with plates/wood floors to act as a limit and to boost the water at the coldest times. nothing is perfect.